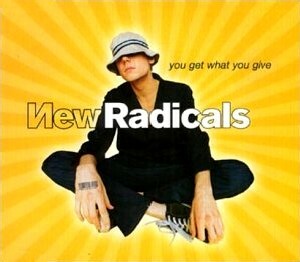 "You Get What You Give" is a song by the New Radicals. It was an international hit, the first and most successful single from their album Maybe You've Been Brainwashed Too. It reached No. 30 on Billboard Hot 100 Airplay in January 1999, No. 36 on the overall Hot 100 and No. 8 on the Billboard Modern Rock chart. It reached No. 5 in the United Kingdom and No. 1 in Canada and New Zealand. The music video for "You Get What You Give" was filmed in the Staten Island Mall, New York and directed by Evan Bernard. New Radicals' front man Gregg Alexander said he chose this setting because he sees the shopping mall as a metaphor for society—a fake, controlled environment engineered to encourage spending. The video showed a group of teenagers led by Alexander, going through the mall wreaking havoc—tossing nets on security guards, placing businessmen in animal cages, knocking over merchandise, hijacking Lambrettas, and moshing in the foodcourt. Maybe You've Been Brainwashed Too is the debut album by the New Radicals, released in late 1998 by MCA Records. Two singles were released off it in 1998 and 1999, "You Get What You Give" and "Someday We'll Know". New Radicals (stylized as Иew Radicals) were an American alternative rock band active for only two years between 1997 and 1999. The band centered on frontman Gregg Alexander, who wrote and produced all of their songs and was the sole constant member. They released one album, 1998's Maybe You've Been Brainwashed Too, an alternative album heavily influenced by the rock and soul of the 1970s, containing—among radio-friendly modern rock tracks and love songs—strong criticism of corporate America.